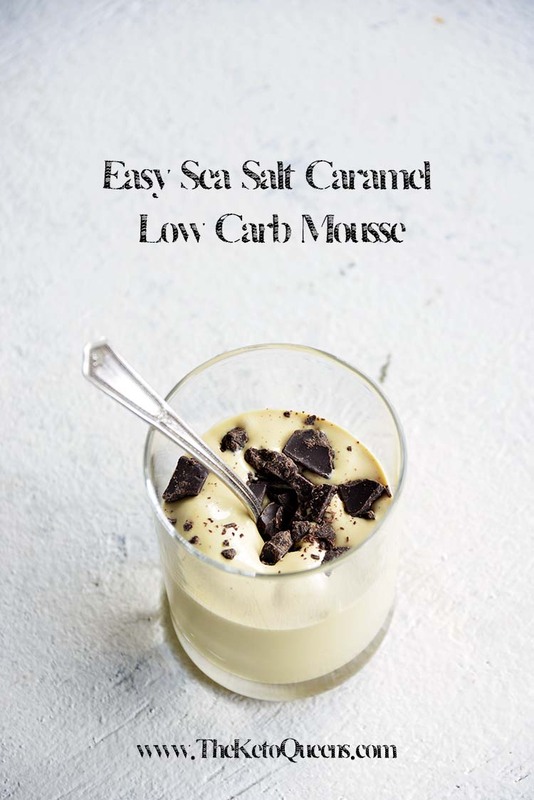 Our Easy Sea Salt Caramel Low Carb Mousse is a delicious way to satisfy a sweet tooth and stay in ketosis! Rich and creamy salted caramel mousse and dark chocolate are the perfect pairing. And the icing on the cake? It makes a fabulous meal or dessert. Give us ten minutes and we’ll satisfy your sweet tooth cravings for salted caramel and chocolate. This delicious low carb mousse recipe can easily double as a quick meal or a decadent dessert. 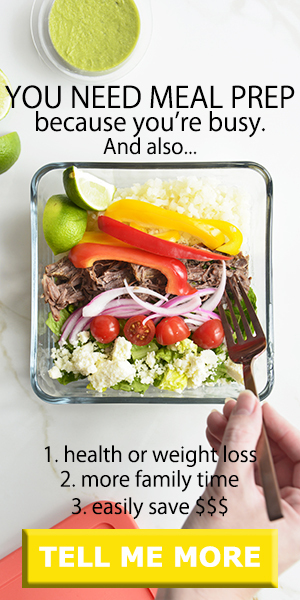 And you can make it in advance and store it in a mason jar in the fridge for a keto-friendly meal on-the-go! Mousse is a dish that’s typically light and somewhat fluffy, due to the incorporation of air in the form of whipped egg whites or whipped cream. A mousse can be either sweet or savory. 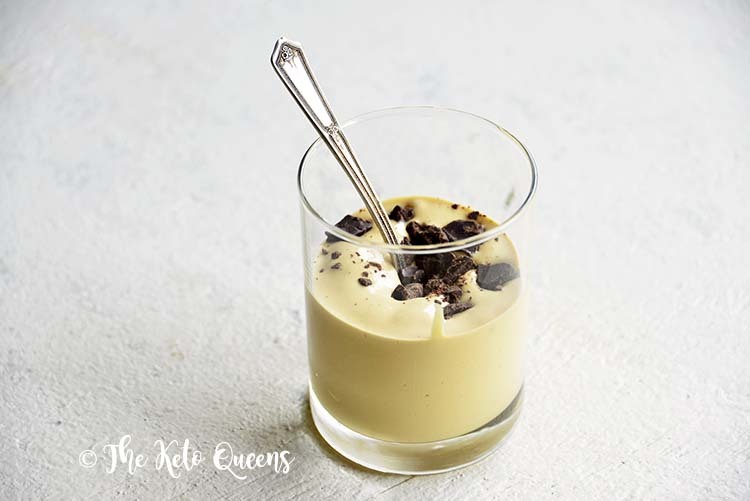 A sweet mousse contains milk and sugar and is usually thickened with egg yolks, unlike a sweet pudding, which is commonly thickened with flour or cornstarch. Either whipped egg whites or whipped cream are used to lighten up the texture of mousse so the end result is an ethereally cloud-like treat. For a classic mousse, milk (or half and half) and sugar are heated on the stovetop until steaming. At this point, the steaming liquid is used to temper egg yolks. Then the tempered egg yolks are added to the liquid, which is cooked until it forms a thick custard. The custard is then removed from the heat source and cooled to room temperature. Once at room temperature, the custard is refrigerated until chilled. 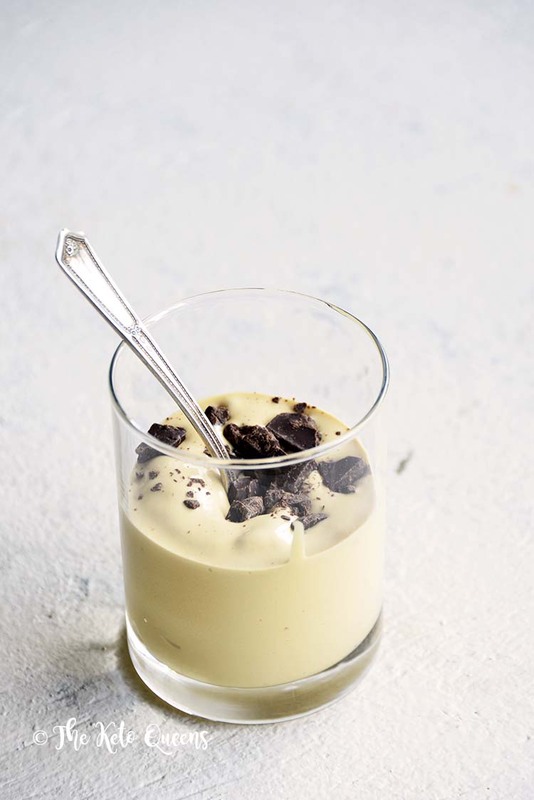 After its chilled, whipped egg whites or whipped cream are folded into the custard to give it its classic light and fluffy mousse-like texture. Mousse is quite easy to remake into a low carb version of itself. The main ingredient that needs to be swapped out is the sweetener. 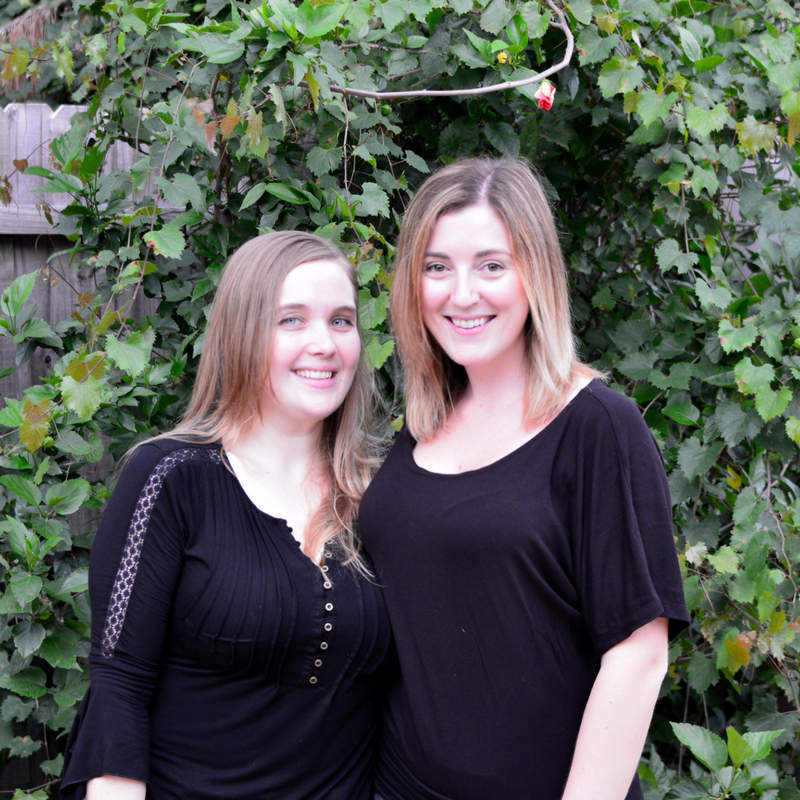 Instead of using regular sugar, alternatives like erythritol and/or stevia or a combination of both are commonly used. Additionally, an alternative thickener (instead of cornstarch, flour, etc.) should be used. 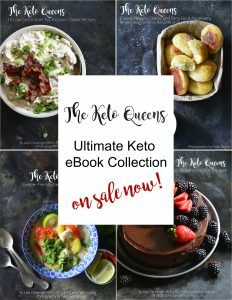 I like to make mousse with heavy cream and egg yolks as the thickener, but a few other common keto friendly thickeners include: xanthan gum, guar gum, gelatin, psyllium powder, etc. 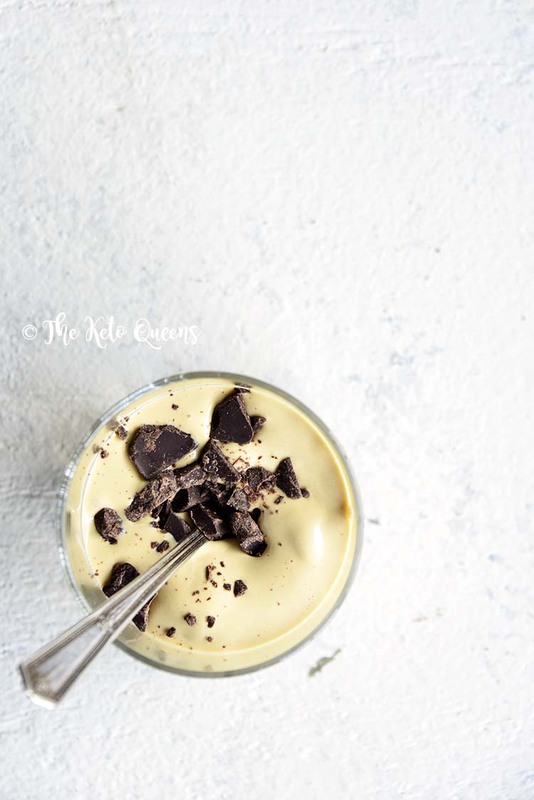 Here we use a keto shake mix to whip up a fast and easy low carb mousse. It has a surprisingly light and fluffy texture similar to regular mousse. This is really convenient because the shake mix has the nutrition needed to make it a complete meal. We fold in a bit of whipped cream to bump up the fat a bit (and increase the satiation level), and also to lighten the texture a little. 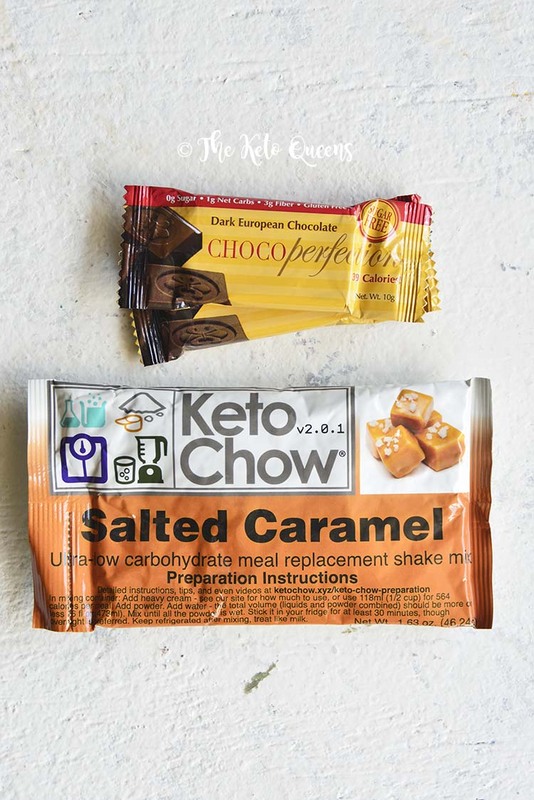 And we add a bit of one of our favorite keto chocolates, just because it pairs so perfectly with the flavor of salted caramel. If sea salt + chocolate is your thing, our low carb mousse recipe is super easy to make into a more chocolaty version of itself. Just mix in one tablespoon of unsweetened natural cocoa powder. Or you can double the amount of chopped chocolate and stir that in instead. The difference between cocoa powder and cacao powder is that cocoa is made from roasted beans and cacao is made from unroasted beans. Raw cacao powder is less processed than cocoa powder, and it retains the living enzymes in cocoa beans. However, even though it’s processed at higher temperatures, cocoa powder still contains a good amount of fiber and antioxidants and has several health benefits. A lot of people enjoy no bake treats in the summer, but we love them year-round! They require minimal effort to make, and can be a great way to make sure you meet your daily macros and get in enough healthy fats. Stir together the shake mix and water until smooth. Fold in the whipped cream. Put it in the freezer for 30 to 45 minutes, stirring every 10 minutes or so. Top with the chocolate and enjoy. Net Carbs: 13g total carbs - 8g fiber - 2g sugar alcohols = 3g net carbs.